Why does a formally democratic country, an official EU candidate with regular elections in a multi-party system need “democratic packages”? Probably because, as yet, it is not all that democratic and still needs to catch up with modern democratic standards. At least for Turkey that is certainly the case. The Turkish constitution is far from being up to modern democratic standards. This document is the most burdensome legacy of the 1980 military coup, commissioned as it was by the coup generals in 1982. More important than freedoms were the limitations to those freedoms – the Constitution is the expression of Turkish nationalism and forced homogeneity. Prior to the AKP coming to power in 2002, individual articles had been amended and reformed several times. In its first legislature, the AKP continued this strategy, amending or reforming individual articles. However, after the party’s second election victory in 2007, it changed its approach to overcome this major problem in Turkey’s democracy. The AKP commissioned the liberal constitutional law professor Ergun Özbudun and a team to write a new constitution – they completed the task in September 2007. The new constitution should have addressed the sensitive issues of citizenship, language in the education system and decentralization to name but a few important issues. The initial plan was to hold a discussion in parliament in early 2008 and approve the new document in spring 2008. It happened differently. A power struggle between the Armed Forces and the AKP paralyzed the political system for at least two years and made the taking of such big steps impossible. However, after the AKP won this power struggle, the party did not revisit the completely new constitution, but opted for a package of 26 articles, which were passed in parliament in May 2010 and later approved by a referendum that September. After the AKP’s election victory in 2011, there was again debate about a new constitution, but the workings in the designated parliamentary commission did not finalize a draft until the summer break of 2013. So, the idea of a “democracy package” emerged, in order to show at least some semblance of reform, to offer something ahead of the election marathon and to also offer the EU at least something positive for the upcoming EU Progress Report. What followed was a long and not very transparent process over the summer. Some analysts counted that the government had announced that the democratic package would be “presented soon” 37 times. Finally on Monday, 30 September at 11am, Prime Minister Erdoğan announced the package in an hour-long speech. Most of that speech touched on historical issues and the successes of the AKP governments. The package itself is small, and offers something to conservative religious citizens, little to Kurds, very little to non-Muslims and some cosmetic touches but nothing for the biggest religious minority, the Alevis. So this package has left a bitter after taste – and in fact it seems more like a political investment ahead of the regional elections to be held in March 2014. The biggest trump card for the core voter base of the AKP, the conservative-religious voters in Anatolia and the big cities (both Turkish and Kurdish), is that women wearing the veil can now join the civil service – strangely excluding posts in the police, the armed forces and the judiciary (judge, prosecutor), based on the claim that the veil would not be “compatible with a uniform”. There is no legal basis for these exceptions: they were included so as not to provoke opposition from the Armed Forces. For the biggest non-Turkish ethnic group, the Kurds, the package is disappointing because two major issues were not tackled. There has been no change to the anti-terror law, which keeps more than a thousand Kurdish activists and politicians in custody for alleged “propaganda for an illegal organization”. Furthermore, the Kurdish movement’s most pressing demand – for mother-tongue education in schools – was only granted to private schools. Considering the socio-economic conditions in the vast majority of the Kurdish provinces, the new ruling will not result in a significant change. One positive is that the letters Q, W, X, which do not exist in the Turkish alphabet, but do in the Kurdish one, will now be legalized and absurd trials held as a result will be stopped. For the Christians, the measures offered in the package were even less significant. Central to their appeals and aspirations was the reopening of the Orthodox Theological School on Princes Island Heybeli (Halki). This was again left out of the package. The school, founded in 1844 has remained closed since 1971. One gets the impression from the declarations made by government ministers after the announcement of the package, that the Turkish government is expecting a parallel move by Greece, such as the opening of a mosque in Athens. Once again Turkish citizens of the Orthodox faith are victims of reciprocity. A surprising, but also confusing move concerned the Syriac community. One of their oldest monasteries, Mor Gabriel, has been accused by neighbouring villages of illegally occupying their land. Even though official documents prove that the monastery is the rightful owner and has been paying taxes on the property since 1935, the courts approved the complaint and the case is still pending. Now Erdoğan has declared that this property will be returned to the monastery, which is nevertheless the actual owner, but nobody knows exactly what will happen to the court case. A real decision à la turca! The biggest confessional group, the Alevi, got nothing but cosmetic changes. The name of Nevsehir University in Cappadocia will be changed to Haci Bektas Veli, an Alevi mystic of the 13th century. However, nothing substantial was in the package, as it avoided addressing issues like the acceptance of Cem houses as official prayer houses and not cultural facilities. The issue that had triggered most debate was the abolition of the compulsory oath in primary schools. Each morning the pupils were required to shout: “I am a Turk, honest and hardworking” and “my existence shall be dedicated to the Turkish existence.” This is a welcome move towards normalizing Turkey, and long overdue too. The announcement that hate speech was to be punished more severely got a mixed reaction. This was a demand from many civil society organizations and is a necessary reform in Turkey. However, the fear now is that the criticism of Islam or devout Muslims will be punished systematically while hate speech targeting Christians, Roma or Jews will be less rigorously targeted. 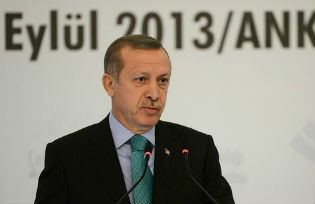 Prime Minister Erdoğan also said that there will be a discussion about the electoral system. Currently Turkey operates a 10 percent minimum threshold for a party to be able to take up seats in Parliament, the highest in the world. This is a positive move, but does not mean that the threshold will be lowered, nor that a more open system for small parties will emerge, because among the options being discussed are majority-based electoral systems, which will favor the larger parties even more. However, the press favourable to the AKP was enthusiastic. The headlines read: “Erdoğan’s Revolution,” “A new era,” “High-standard for democracy,” “20 steps for the New Turkey” or “Welcome Freedom.” For the pro-government groups, this might be right. For the Kurds, the Alevi and the Christians this means that they will have to wait for after the national elections in 2015 to maybe then get their legitimate rights in other packages…… or finally a new constitution.